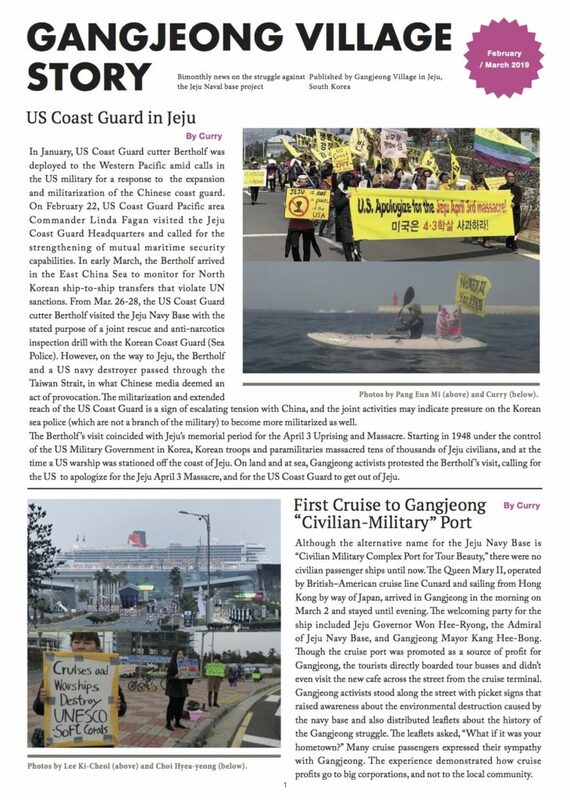 US Coast Guard in Jeju / First Cruise to Gangjeong “Civilian-Military” Port / 2nd Jeju airport? It is an air force base! / Henoko base construction despite referendum / Solidarity visit in Okinawa / Hawaii-Alaska solidarity resists aerospace industry / ROK military satellite and F35-A fighter jets / Citizens’ campaign for a Jeju Non-nuclear Peace bylaw / The first for-profit hospital in Jeju is being revoked / Gangjeong still in agony as big money flows in the name of development / 7 years since Gureombi Rock was blasted / Illegal and unreasonable proposals of cost- sharing for the USFK / 19 Gangjeong villagers and activists offered pardons without truth-seeking / End of War exercises? / Gangeong Women on International Women’s Day etc.